From the World Cup to the IBO Triple Crown and ASA Shooter of the year, Team Mathews dominated the podium this season with the TRX platform. For 2018, we’ve added the TRX 38 to the line as a slightly shorter, yet highly stable option for target shooters. The TRX38 will come standard with the new 70V mod, this new mod allows for a deeper valley while still offering the low let off option target shooters look for. The existing TRX mods in both 70 and 80% let off will also work on this new bow. 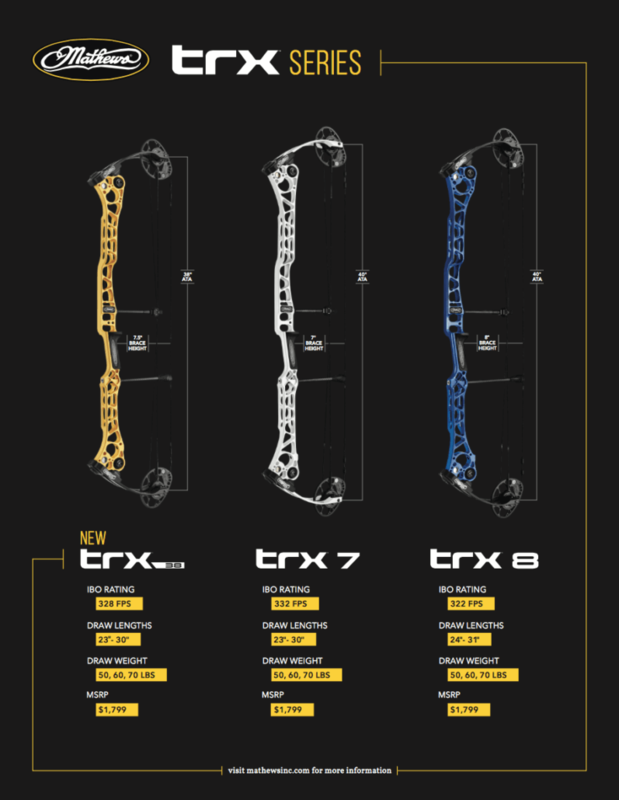 See below for full specs on the entire TRX Series and contact me if you have any questions on the new bow or ordering information. Note: The TRX 38 comes in all the same color options as the TRX 7 and TRX 8 (black, white, red and blue), with the addition of the new yellow finish seen below.